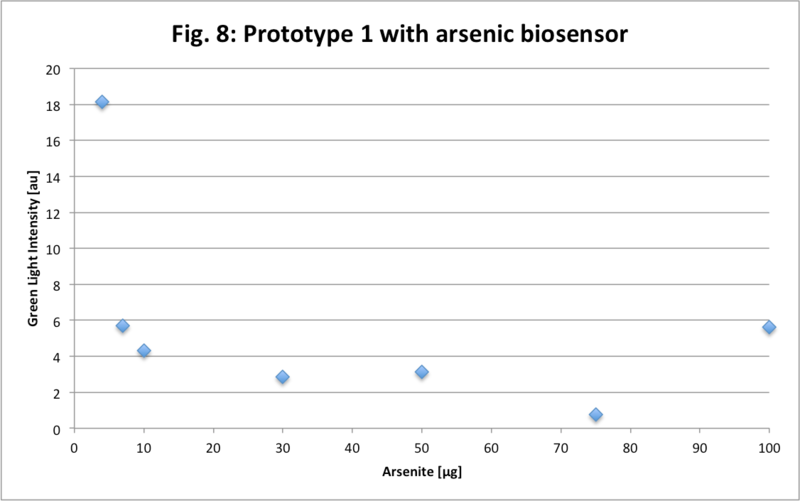 We first tested our prototype with dextran FITC, then eGFP-expressing E.Coli and finally the last step was to test it with our real target: the Arsenic biosensor. For this purpose, we were very well received in Dr. van der Meer’s lab, where Siham Beggah took good care of us, leading us into the lab and explaining all the steps. She gave us a very clear Protocol, so we could reproduce the experiment if we once get an authorization to handle Arsenic at EPFL. 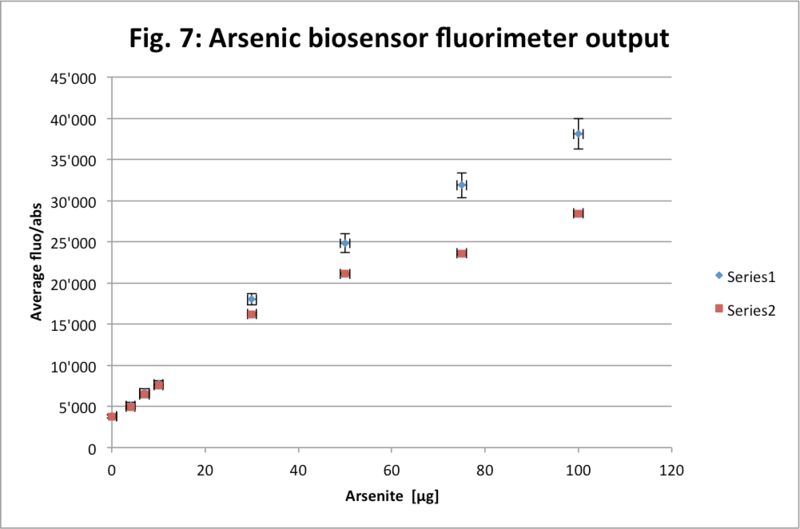 We tested our two Prototypes with solutions containing different concentrations of Arsenic, we measured fluorescence after one hour and three hours of incubation (in principle, all the eGFP have been expressed and the signal is maximal). In Fig. 7 and 8, we can see the results of this Wet-lab. The measures with the lab fluorometer shows good results as expected, but we had some problems with our prototypes as we can see on Fig. 8. Indeed, for Prototype I the data do not behave as they should, this is probably due to the change of sample-holder (which was smaller), and the fact that the prototype was not fixed yet. The Prototype II had no interesting results, probably because the signal couldn’t be distinguished from the LED-light despite the presence of the filter. We learned that a luciferase-assay could be more sensitive and take less time, as it depends on a substrate that produce bioluminescence and not on the accumulation of a protein (eGFP). For this study, Siham and her team did measurement on a boat, the laboratory was constrained in a container, which is a good example of mobile labs. In addition to the fluorometer measures, we tried a blue light transilluminator, called Safe Imager, that has a lot of LEDs which light is filtered by a plastic flat plate. The pictures are in the following gallery. During this day, we got several ideas for future improvements/orientation change, like adding more LEDs to analyze several samples at the same time, positioning the sample vertically.